A high percentage of homeowners in London who have older style properties are seeking to restore their hardwood flooring to former glory and glamour. Beautiful shiny wood flooring brings effortless elegance and grace to any type of room. Public rooms such as dining rooms, hallways, living rooms and conservatories benefit greatly from well-maintained wood flooring. If you have a floor which is perhaps not in the best of conditions and requires some care and attention to make it beautiful again you have two choices. You can undertake a specialist restoration, which involves a professional sanding, repair or replacement of damaged or rotten boards, gap filling and the finishing veneer of your choice, or you can undertake the restoration of your wood floor yourself. Either way it never does any harm to have a London floor sanding company offer a no-obligation quotation for the work so that you can understand what is fully involved. However for the purpose of this article we will assume you are going it alone. In an ideal world real wood flooring should be refinished every 5 to 10 years - depending upon usage - with some little maintenance (mostly cleaning) in between. However if your floor has been languishing below old floor coverings and has only recently been unearthed then it may be much longer than a decade since it last saw some TLC. The first step is obviously to clear the room of absolutely everything including skirting, dados, fittings and unhinge doors if you can. Ensure there is a steady flow of fresh air throughout as sanding can become extremely dusty and is hazardous for asthmatic or allergy sufferers. The most important part of the restoration process is sanding. Get that right and you have a solid base upon which your restoration can be built. Get it wrong and your floor will be botched and expensive to put right. That being said, avoid a ruined floor by hiring a belt or drum sanding machine (available from your local DIY store or plant hire shop). These machines operate by being walked along the grain of the wood, sanding as they do. On your part, the effort is all in technique and manoeuvrability rather than strength so in theory at least successful sanding can be carried out by people of all ages. When you hire your sander you will have to purchase rounds of sandpaper which you will fit into the machine. If your floor has not been sanded for a long time, choose the coarsest grain of paper available, working up to a finer grain during subsequent sandings. 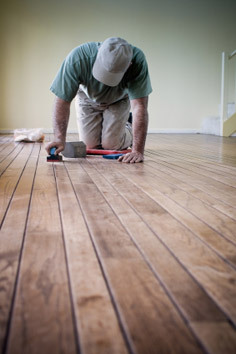 It is likely that your floor will require at least two and possibly even three sandings, depending upon its condition. Before sanding however you would be wise to check the floor thoroughly for protruding nails, gaps between the boards and loose or damaged planks. Remove or hammer nails in, fill gaps with epoxy and repair or replace damaged boards before embarking on the sanding process. When you use the sander for the first time keep in mind never to allow the machine to be switched on unless it is moving. A stationary machine will cause damage to the boards which could be expensive to put right. You will know your floor has received its final sanding when it is uniformly smooth and even to the touch. Sweep or vacuum the floor and you are ready to apply the finishing coat. Whether you choose varnish, woodstain or oil, remember to follow manufacturer’s guidelines and allow adequate time for drying. After the final coat has been applied wait 48 hours before returning fittings and furniture to the room.